We had a frighteningly close encounter with a black bear. 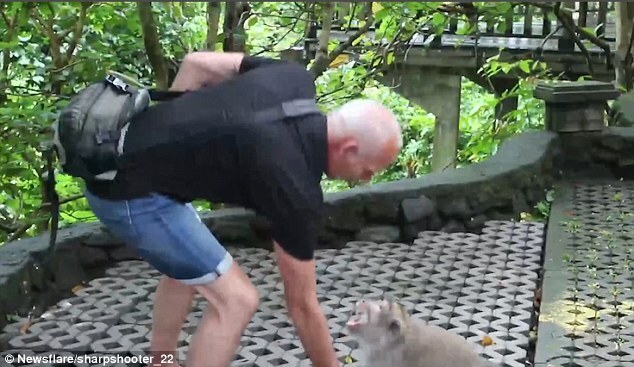 This is the terrifying moment a tourist is bitten in the arm by an angry monkey as he tries to pose for a photo with it. The man can be seen grinning as the Balinese long tailed monkey playfully crawls over the man’s back at Sacred monkey Forest in Ubud, Bali, where tourists are allowed interact with the animals. 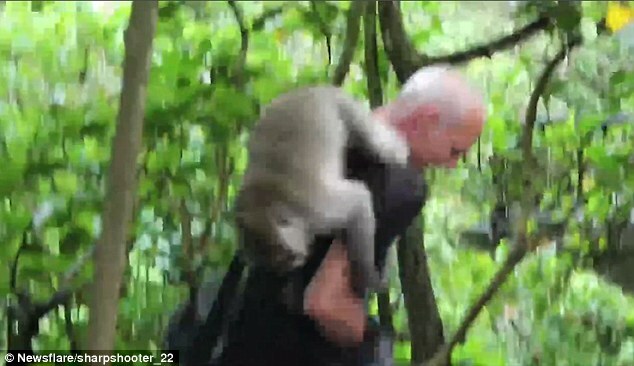 We see the monkey, unable to get into the bag on the man’s back, climb down his arm and try and get at the bag on the ground. Ruth grinned at him as she waved goodbye. He grinned at me from the doorway. She gave him a playful push. She was in a playful mood. She nudged him playfully in the ribs. Ants were crawling over the cheese. I keep the sweets up here where the children can’t get at them. I’ve put the cake on a high shelf where he can’t get at it. The monkey sniffs at it but when the man goes to pick it up, the monkey bears his teeth at him before sinking them into his arm. 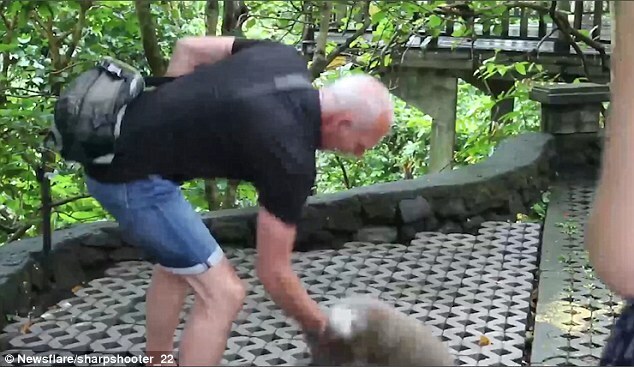 The man rips his hand away from the monkey pulling the bag up with it. 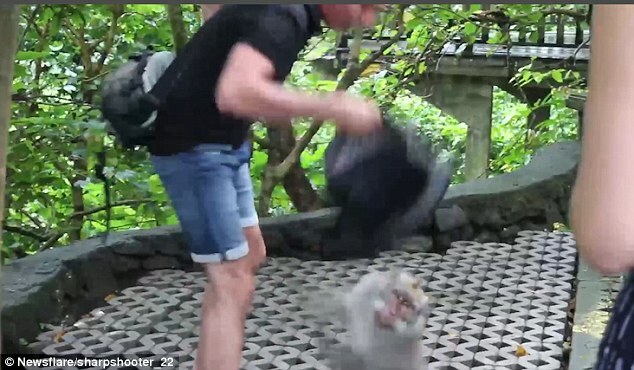 The footage was filmed by a tourist and later posted online as a warning to social media users that the cute animals do have a wild side when trying to get at food. He sniffed his socks to see if they needed washing. Dogs love sniffing each other. She sniffed at her glass of wine before tasting it. Amanda sniffed and wiped her nose. Henry sniffed at the flowers appreciatively. He ripped off his shirt and dived into the water. Pictures had been ripped from the walls. A hurricane ripped through Rhode Island yesterday. According to the tourist filming, the man quickly left the area and it was unclear whether he was injured. The monkey forest is a sanctuary or natural habitat of Balinese long tailed Monkeys that became a major tourist attraction, with around 700 monkeys and 186 species. 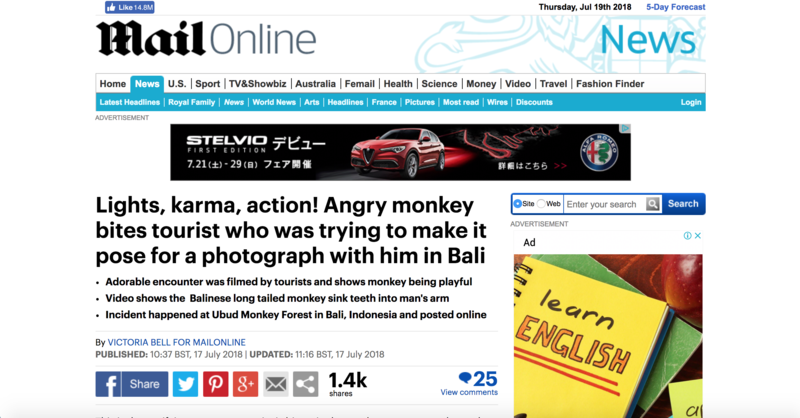 There are several reports where others have been bitten at the park including one where a video shows a monkey trying to bite a man’s face as he posed for a picture with it. Monkey bites are an important risk among travelers and after dog bites, are the most common for travelers.